This I2C tutorial shows you how the I2C protocol or more correctly written I2C (sometimes written as IIC) stands for Inter IC Communication and is intended for very short distance communication between ICs on a single PCB. It gives you a fully defined protocol for data transfer between multiple devices over two wires. The great strength of the protocol is that it only requires two wires yet can have many connected devices and all of these can transmit and receive data at high speed. Unlike the SPI protocol the I2C protocol has an acknowledgement feature that means a sending device knows that a receiver has accepted the data. This means I2C is more robust when in a noisy environment. For SPI there is also no concept of multiple master devices but SPI is faster. Usually a master device sends out data to slaves (that give the ACK signal - a single bit returned at the end of transmission) but you can have more than one master device in a system allowing great flexibility of use for I2C. In this I2C tutorial you will learn all about the 2 wire I2C serial protocol; How easy it is to use, how it works and when to use it. The I2C protocol is a very useful serial communication protocol. This popular system is used in a huge range of chips - just a few examples from this site include the DS1307 (RTC), SSD1306 (OLED Display), DS23017 (Serial expander). It allows you to connect many devices to a single set of two wires and then communicate individually with each device with which you can send and receive data. Warning: The protocol is designed for single board communication it is not a long distance comms. system. You can find instances (horror stories) of people designing a multi drop inter office comms system with I2C extenders - just don't do it - it ends in tears! This I2C tutorial shows you how the I2C protocol works at the physical bit level discussing single master mode (a single controlling device) which is the most common use for I2C in a small system. Note: You can find Master mode soft I2C routines in the DS1307 RTC project. I2C Tutorial - Open drain connections. I2C works by using open drain connections. The two resistors above are the pull-up resistors that allow the whole system to work - when all devices are inactive then the "pullups" pull the signal wire to the supply voltage. Warning: you must have one pullup resistor per signal wire (SCL and SDA) and not more! At any time a master device can start a transmission by pulling SDA low while SCL is high (a unique specific condition that other I2C devices recognise as the start of a master transmission). The slave device listens to the next 8 serial bits of the address to see if it matches its own address (each I2C must have a unique address built in). If it does recognise the next 8 bits as an address from the master device. The next bit tells the slave that it is to read or write data for the following packet. This is followed by the ACK bit that the slave must generate to indicate that it understood the address. The diagram further down shows this in graphical form. When the ACK signal is to be generated the master device releases the SDA line and the open drain output is pulled high. This allows the slave device to generate the ACK signal by pulling it low (only for that specific bit period). Note: Another protocol that uses the open - drain concept is the Dallas 1-wire protocol - but that is far slower. The advantage o the 1-wire protocol is that it allows powering of the device through the signal wire! The 1-wire protocol also allows transmission over very large distances unlike the I2C protocol. On this site this project (DS18B20 ) uses the 1-wire protocol. The phillips I2C protocol defines the concept of master and slave devices. A master device is simply the device that is in charge of the bus at the present time and this device controls the clock and generates START and STOP signals. Slaves simply listen to the bus and act on controls and data that they are sent. The master can send data to a slave or receive data from a slave - slaves do not transfer data between themselves. Multi master operation is a more complex use of I2C that lets you have different controlling devices on the same bus. You only need to use this mode if you have more than one microcontroller on the bus (and you want either of them to be the bus master). Multi master operation involves arbitration of the bus (where a master has to fight to get control of the bus) and clock synchronisation (each may a use a different clock e.g. because of separate crystal clocks for each micro). Note: Multi master is not covered in this I2C tutorial as the more common use of I2C is to use a single bus master to control peripheral devices e.g. 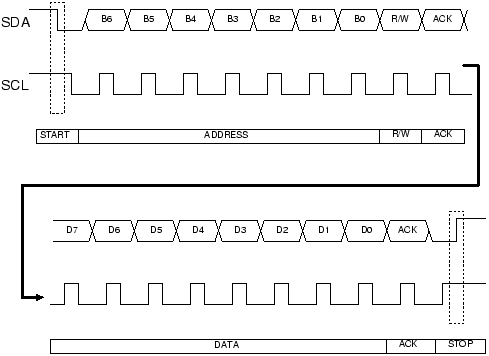 serial memory, ADC, RTC etc. The I2C interface uses two bi-directional lines meaning that any device could drive either line. In a single master system the master device drives the clock most of the time - the master is in charge of the clock but slaves can influence it to slow it down (See Slow Peripherals below). The two wires must be driven as open collector/drain outputs and must be pulled high using one resistor each (that is one resistor per I2C line i.e.for data and clock) - this implements a 'wired NOR function' - any device pulling the wire low causes all devices to see a low logic value - for high logic value all devices must stop driving the wire. Note : If you use I2C you can not put any other (non I2C) devices on the bus as both lines are used as clock at some point (generation of START and STOP bits toggles the data line). So you can not do something clever such as keeping the clock line inactive and use the data line as a button press detector (to save pins). You will often will find devices that you realise are I2C compatible but they are labelled as using a '2 wire interface'. The manufacturer is avoiding paying royalties by not using the words 'I2C'! There are two wires (three if you include ground!, and four if you also include power!) - but power and ground are taken as given i.e. they are available on a PCB as needed so don't really count. Standard clock speeds are 100kHz and 10kHz but the standard lets you use clock speeds from zero to 100kHz and a fast mode is also available (400kHz - Fast-mode). An even higher speed (3.4MHz - High-speed mode) for more demanding applications - The mid range PIC won't be up this mode yet! Note: The low-speed mode has been omitted (10kHz) as the standard now specifies the basic system operating from 0 to 100kHz. Note: Even if you run an I2C peripheral at a high speed the overall data rate depends on how fast you can push data into the internal I2C module and that depends on the processor speed. A slow slave device may need to stop the bus while it gathers data or services an interrupt etc. It can do this while holding the clock line (SCL) low forcing the master into the wait state. The master must then wait until SCL is released before proceeding. 1. Send the START bit (S). 2. Send the slave address (ADDR). 3. Send the Read(R)-1 / Write(W)-0 bit. 4. Wait for/Send an acknowledge bit (A). 5. Send/Receive the data byte (8 bits) (DATA). 6. Expect/Send acknowledge bit (A). 7. Send the STOP bit (P). Note: You can use 7 bit or 10 bit addresses. The sequence 5 and 6 can be repeated so that a multibyte block can be read or written. A master device sends the sequence S ADDR W and then waits for an acknowledge bit (A) from the slave which the slave will only generate if its internal address matches the value sent by the master. If this happens then the master sends DATA and waits for acknowledge (A) from the slave. The master completes the byte transfer by generating a stop bit (P) (or repeated start). A similar process happens when a master reads from the slave but in this case, instead of W, R is sent. After the data is transmitted from the slave to the master the master sends the acknowledge (A). If instead the master does not want any more data it must send a not-acknowledge which indicates to the slave that it should release the bus. This lets the master send the STOP or repeated START signal. Each device you use on the I2C bus must have a unique address. For some devices e.g. serial memory you can set the lower address bits using input pins on the device others have a fixed internal address setting e.g. a real time clock DS1307. You can put several memory devices on the same IC bus by using a different address for each. Each device manufacturer is assigned a set of addresses so devices should not conflict with each other. Note: The maximum number of devices is limited by the number of available addresses (and you need non-conflicting addresses) and by the total bus capacitance (maximum 400pF). The general call address is a reserved address which when output by the bus master should address all devices which should respond with an acknowledge.Its value is 0000000 (7 bits) and written by the master 0000000W. If a device does not need data from the general call it does not need to respond to it. Most of these are not that useful for PIC microcontrollers except perhaps the START byte and 10 bit addressing. START (S) and STOP (P) bits are unique signals that can be generated on the bus but only by a bus master. Reception of a START bit by an I2C slave device resets its internal bus logic. This can be done at any time so you can force a restart if anything goes wrong even in the middle of communication. 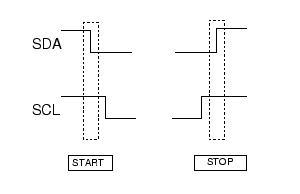 START and STOP bits are defined as rising or falling edges on the data line while the clock line is kept high. The following diagram shows the above information graphically - these are the signals you would see on the I2C bus. I2C Tutorial : START (S) and STOP (P) bits. Note : In a single master system the only difference between a slave and a master is the master's ability to generate START and STOP bits. Both slave and master can control SDA and SCL. The only difference is that for a repeated start you can repeat the sequence starting from the stop bit (replacing the stop bit with another start bit). and you can do this indefinitely. Note: Reception of both S or Sr force any I2C device reset its internal bus logic so sending S or Sr is really resetting all the bus devices. This can be done at any time - it is a forced reset. The main reason that the Sr bit exists is in a multi master configuration where the current bus master does not want to release its mastership. Using the repeated start keeps the bus busy so that no other master can grab the bus. Because of this when used in a Single master configuration it is just a curiosity. All data blocks are composed of 8 bits. The initial block has 7 address bits followed by a direction bit (Read or Write). Following blocks have 8 data bits. Acknowledge bits are squeezed in between each block. Each data byte is transmitted MSB first including the address byte. To allow START and STOP bit generation by the master the data line (SDA) must not be changed while the clock (SCL) is high - it can only be changed when the clock is low. The acknowledge bit (generated by the receiving device) indicates to the transmitter that the the data transfer was ok. Note that the clock pulse for the acknowledge bit is always created by the bus master. The acknowledge data bit is generated by either the master or slave depending on the data direction. For the master writing to a slave (W) the acknowledge is generated by the slave. For the master receiving (R) data from a slave the master generates the acknowledge bit. In this case the slave generates the acknowledge signal. When a not-acknowledge is received by the bus master the transfer has failed and the master must generate a STOP or repeated START to abort the sequence. In this case the master generates the acknowledge signal. Normally the master will generate an acknowledge after it has received data but to indicate to the slave that no more data is required on the last byte transfer the master must generate a 'not-acknowledge'. This indicates to the slave that it should stop sending data. The master can then generate the STOP bit (or repeated START). The general call function is a specialised command that must be accepted by all devices on the bus. It allows a master device to communicate to all devices at the same time - giving them some data. Perhaps you would use this to command a software reset in the case of a watchdog timeout in the processor. To use the I2C mode in the 16F88 the SDA and SCL pins must be initialised as inputs (TRIS bit = 1) so that an open drain effect is created. By setting them as inputs they are not driving the wires and an external pull up resistor will pull the signals high. The 16F88 fully implements all slave functions except general call. The general call function does not really matter as it is quite specialised commanding all devices on the bus to use some data. A low output is generated by driving the signal line low and changing the pin direction to an output. A high output is generated by changing the pin direction to an input so that the external resistor pulls the signal high. In slave mode this action is done for you by the SSP module (the outputs of the register at SDA and SCL are driven low automatically - regardless of the state of the register value). Basically there is very limited master mode functionality. There are two interrupts that activate on reception of either a START or STOP condition. These two interrupts are only useful in a multi master mode system where it is necessary for the non-master device to detect the start and stop conditions. So for a single master system they are of no use at all! Note When the SSP module is active SDA and SCL output are always set at zero regardless of the state of the register values. So all you have to do is control the port direction. In master mode (16F88) SDA and SCL must be controlled using software. Note: If you want a chip with full master and slave mode operation look for the MSSP module in a PIC chip e.g. 16F877A - then you won't need more software - just enough to drive the module. DS1307 Real time clock (bit banged I2C).